The world’s human population is currently experiencing exponential growth even though human reproduction is far below its biotic potential (Figure 1). To reach its biotic potential, all females would have to become pregnant every nine months or so during their reproductive years. Also, resources would have to be such that the environment would support such growth. Neither of these two conditions exists. In spite of this fact, human population is still growing exponentially. Figure 1. 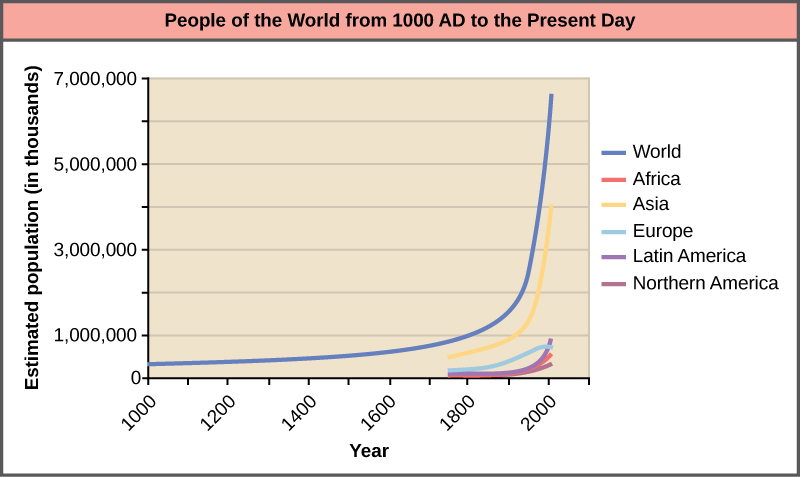 Human population growth since 1000 AD is exponential (dark blue line). Notice that while the population in Asia (yellow line), which has many economically underdeveloped countries, is increasing exponentially, the population in Europe (light blue line), where most of the countries are economically developed, is growing much more slowly. A consequence of exponential human population growth is the time that it takes to add a particular number of humans to the Earth is becoming shorter. 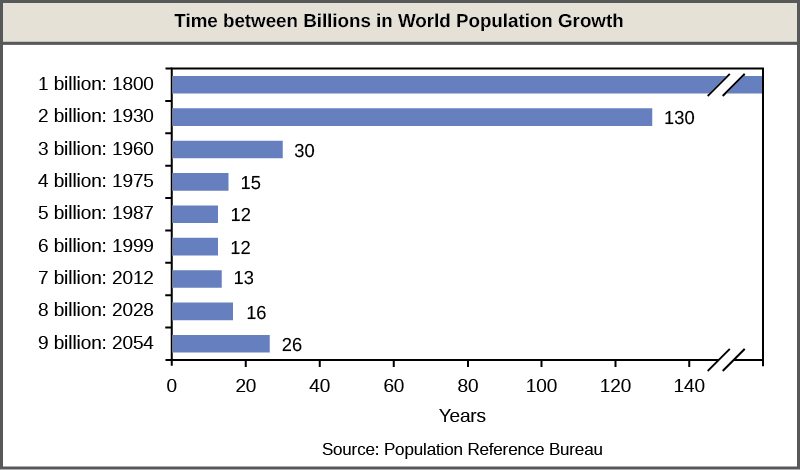 Figure 2 shows that 123 years were necessary to add 1 billion humans in 1930, but it only took 24 years to add two billion people between 1975 and 1999. As already discussed, at some point it would appear that our ability to increase our carrying capacity indefinitely on a finite world is uncertain. Without new technological advances, the human growth rate has been predicted to slow in the coming decades. However, the population will still be increasing and the threat of overpopulation remains. Humans are unique in their ability to alter their environment with the conscious purpose of increasing its carrying capacity. This ability is a major factor responsible for human population growth and a way of overcoming density-dependent growth regulation. Much of this ability is related to human intelligence, society, and communication. Humans can construct shelter to protect them from the elements and have developed agriculture and domesticated animals to increase their food supplies. In addition, humans use language to communicate this technology to new generations, allowing them to improve upon previous accomplishments. Other factors in human population growth are migration and public health. Humans originated in Africa, but have since migrated to nearly all inhabitable land on the Earth. Public health, sanitation, and the use of antibiotics and vaccines have decreased the ability of infectious disease to limit human population growth. In the past, diseases such as the bubonic plaque of the fourteenth century killed between 30 and 60 percent of Europe’s population and reduced the overall world population by as many as 100 million people. Today, the threat of infectious disease, while not gone, is certainly less severe. According to the World Health Organization, global death from infectious disease declined from 16.4 million in 1993 to 14.7 million in 1992. To compare to some of the epidemics of the past, the percentage of the world’s population killed between 1993 and 2002 decreased from 0.30 percent of the world’s population to 0.24 percent. Thus, it appears that the influence of infectious disease on human population growth is becoming less significant. The age structure of a population is an important factor in population dynamics. Age structure is the proportion of a population at different age ranges. Age structure allows better prediction of population growth, plus the ability to associate this growth with the level of economic development in the region. Countries with rapid growth have a pyramidal shape in their age structure diagrams, showing a preponderance of younger individuals, many of whom are of reproductive age or will be soon. This pattern is most often observed in underdeveloped countries where individuals do not live to old age because of less-than-optimal living conditions. Age structures of areas with slow growth, including developed countries such as the United States, still have a pyramidal structure, but with many fewer young and reproductive-aged individuals and a greater proportion of older individuals. Other developed countries, such as Italy, have zero population growth. The age structure of these populations is more conical, with an even greater percentage of middle-aged and older individuals. The actual growth rates in different countries are shown in Figure 4, with the highest rates tending to be in the less economically developed countries of Africa and Asia. Figure 3: Typical age structure diagrams are shown. The rapid growth diagram narrows to a point, indicating that the number of individuals decreases rapidly with age. In the slow growth model, the number of individuals decreases steadily with age. Stable population diagrams are rounded on the top, showing that the number of individuals per age group decreases gradually, and then increases for the older part of the population. Age structure diagrams for rapidly growing, slow growing and stable populations are shown in stages 1 through 3. What type of population change do you think stage 4 represents? Figure 4: The percent growth rate of population in different countries is shown. Notice that the highest growth is occurring in less economically developed countries in Africa and Asia. Many dire predictions have been made about the world’s population leading to a major crisis called the “population explosion.” In the 1968 book The Population Bomb, biologist Dr. Paul R. Ehrlich wrote, “The battle to feed all of humanity is over. In the 1970s hundreds of millions of people will starve to death in spite of any crash programs embarked upon now. At this late date nothing can prevent a substantial increase in the world death rate.” While many critics view this statement as an exaggeration, the laws of exponential population growth are still in effect, and unchecked human population growth cannot continue indefinitely. Efforts to control population growth led to the one-child policy in China, which used to include more severe consequences, but now imposes fines on urban couples who have more than one child. Due to the fact that some couples wish to have a male heir, many Chinese couples continue to have more than one child. The policy itself, its social impacts, and the effectiveness of limiting overall population growth are controversial. In spite of population control policies, the human population continues to grow. At some point the food supply may run out because of the subsequent need to produce more and more food to feed our population. The United Nations estimates that future world population growth may vary from 6 billion (a decrease) to 16 billion people by the year 2100. There is no way to know whether human population growth will moderate to the point where the crisis described by Dr. Ehrlich will be averted. Another result of population growth is the endangerment of the natural environment. Many countries have attempted to reduce the human impact on climate change by reducing their emission of the greenhouse gas carbon dioxide. However, these treaties have not been ratified by every country, and many underdeveloped countries trying to improve their economic condition may be less likely to agree with such provisions if it means slower economic development. Furthermore, the role of human activity in causing climate change has become a hotly debated socio-political issue in some developed countries, including the United States. Thus, we enter the future with considerable uncertainty about our ability to curb human population growth and protect our environment. Visit this website and select “Launch movie” for an animation discussing the global impacts of human population growth. The world’s human population is growing at an exponential rate. Humans have increased the world’s carrying capacity through migration, agriculture, medical advances, and communication. The age structure of a population allows us to predict population growth. Unchecked human population growth could have dire long-term effects on our environment.